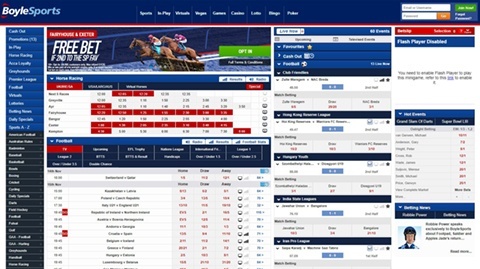 Boylesports started off with a few shops in Ireland and have now become a major online betting operation that service millions of customers. They are especially strong when it comes to horse racing and have many excellent promotions including a generous new customer bonus. When you open a Boylesports account, you can enjoy a welcome bonus totalling £25 and the Irish bookmaker make it easy for you to qualify for the free bets by following the simple steps. Once you have fulfilled the above steps, then Boylesports will credit you with a free £5 bet that can be used on any sports betting market. After you have received your initial £5 free bet, there is also the chance to claim a further 4 x £5 free bets. Every time you place three bets, you will receive a matched free bet equal to 50% of the average stake. So if you place three £10 bets, then you would receive £5 free. Every qualifying bet that you place must be at odds of 1/2 or bigger. It’s a simple case of betting at least £10 every time at the above odds or bigger and the free bets will start mounting up. Boylesports customers can now enjoy their Cash Out facility, allowing you to take the option of settling your bet and taking a percentage of the possible returns were the bet to win. Cash out is currently available for Football, Tennis, GAA, Snooker, Darts, Rugby, Golf, Cricket, Baseball, Basketball and Ice Hockey. You can Cash Out of pre-match and In-Play bets, with Boylesports indicating on the homepage which current betting markets are available to claim an early return and this is only applicable to win-only bets as well as multiple bets such as an accumulator. Boylesports know that their customers enjoy a horse racing bet and they pick out two meetings every day where you will get a Free Bet if your selection finishes 2nd to the SP favourite. The maximum refund is £20 and online customers need to make sure they’re opted in to qualify for this promotion. Customers can also enjoy extra places on selected horse racing, with several races selected every day for this promotion, while you can enjoy Best Odds Guaranteed on horse racing and greyhound racing with Boylesports. There’s also something called the Fair Play Free Bet if your horse fails to start. Boylesports are on point when it comes to the fact that many customers enjoy placing accumulator bets, with Acca Insurance meaning that you will receive a free bet if one leg loses in an accumulator bet that features at least five selections. This applies to all markets and all sports, so it’s not just football punters who can enjoy this promotion. On a similar note, Acca Loyalty is applicable to all sports and is another way of getting extra value by being a Boylesports customer. You can get a free £5 accumulator for every 5 x £5 any combination sport accumulators that you place. Opt in is required and the cumulative odds must be at least 3/1 in order to qualify. 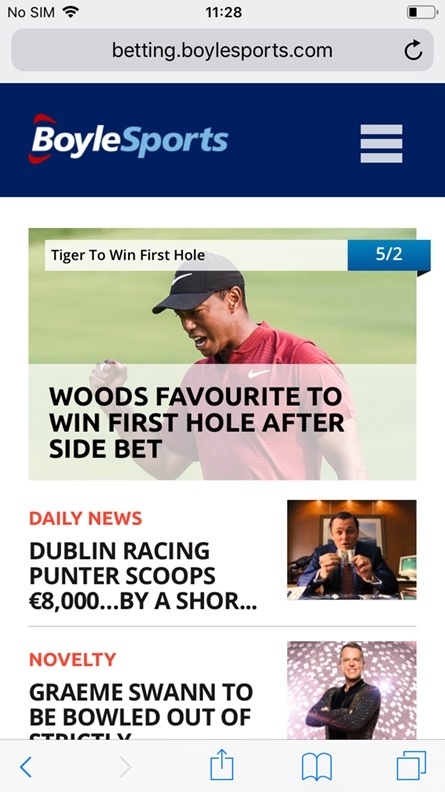 Boylesports have created an app which is available for iOS and Android users, with customers able to download this in seconds and log into their account to place bets in the normal way. The app actually facilitates multiple bets, while you’re also able to cash out your bets as you would do on other platforms. 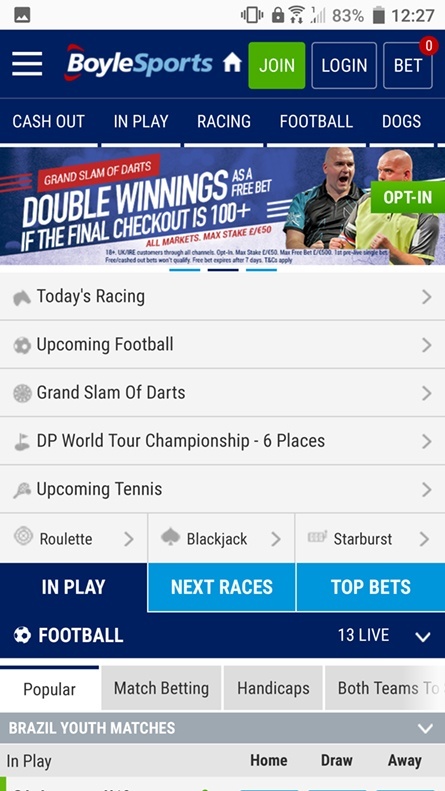 One particular feature we like about the app is the ability to personalise your own content, with the Bet Builder functionality now covering all live UK football matches and Boylesports also have intuitive coupon navigation. They also serve up fast racing results on the app. Boylesports go the extra mile with their range of payment options which means that customers can choose from a wide range of methods to fund their account and also make a withdrawal. Depositing is instant, while withdrawing funds means the money is back in your account within 3-5 working days. You can choose from a range of options and many customers prefer the debit or credit card options such as Visa, MasterCard, Maestro or Delta. There is also Skrill, PayPal, Neteller and paysafecard which are among the popular e-wallet options and customers can also select Euteller, Instadebit, giropay and Trustly.